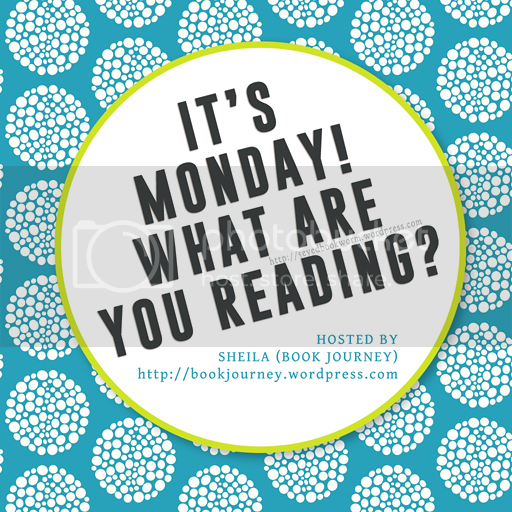 Have you read it, by any chance? I'd love to know what you thought about it. 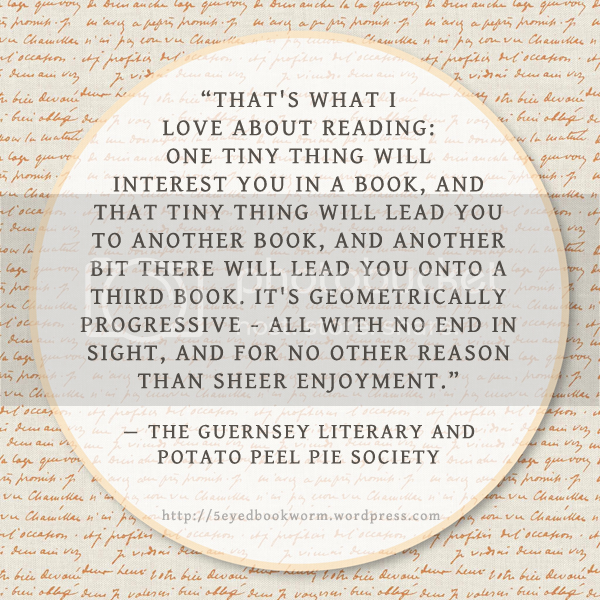 Do you have any favorite quote from the book that you would like to share? 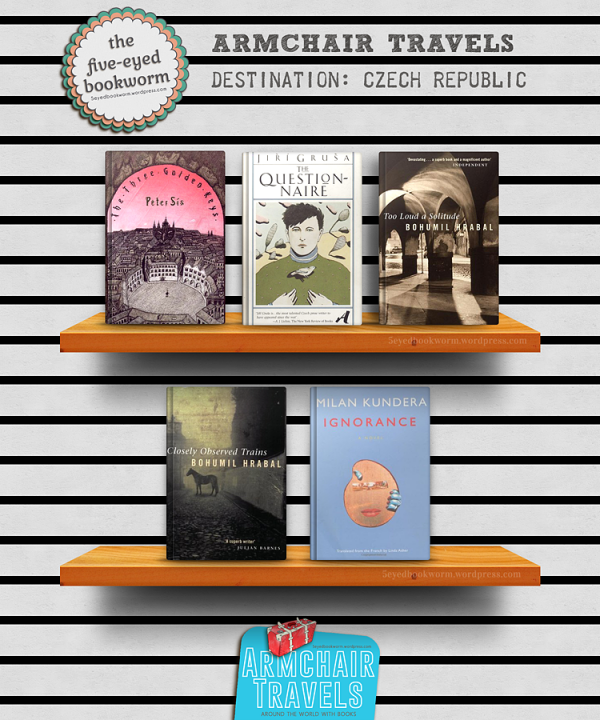 Books set in the Czech Republic. Read this post in my blog. The strength of Watchmen as a graphic novel lies not only in its great illustrations and story, but also of its treatment of masked crusaders and superheroes. This graphic novel did not aim to glorify their presence in the world. It focused on the dissection and deconstruction of masked heroes and superheroes, as well as the exploration of the paradoxes of their existence and purpose. Obviously there is a distinction between superheroes and masked ones, the latter as vulnerable as all of us, but possess the right skills and perhaps intuition to fight the bad guys. There’s something visceral and profound in the exploration of these lives. They are driven to defend people but also need to deal with their own lives and relationships. They are human after all – they may evoke power but they also have their flaws. Such complexities and quandaries abound not only in the characters but the events that transpire within the graphic novel. There are stories within stories, philosophical at times and full of symbolism. This is what makes it so deep and dense. I found myself going back to some pages to fully assimilate what is being said and where the story is going to. There is also the dilemma everyone is facing, whether they are superheroes or ordinary people. Commentaries are not given sparsely. There is Rorschach’s psychiatrist and a newspaper vendor that lends more depth to the entire story by giving us their own observations not only of the characters but the world they live in. They give us an insight into the characters’ minds, revealing their reality and struggles while also discussing the more weighty subjects like war, child abuse and violence. Their voices ground you to the nature of being human just as much as the masked heroes’ lives. 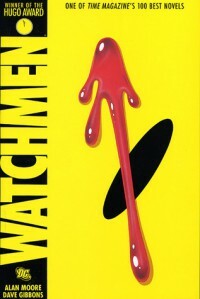 Watchmen is a very complex and compelling story, well worth a second or even a third read. This graphic novel broke grounds when it was released and it deserves all of its accolades. A last minute decision forever alters the life of Kazuyuki Asakawa in this gripping story about a video of incongruous images delivering a death threat to the viewer. Four mysterious deaths in Tokyo, which are thought to be connected, piques the interest of Asawaka, a journalist. This is a race against time to solve the mysteries of the videotape. It’s been quite a long time since I read any book from the horror genre. Reading this book reminded me of those days when I enjoyed watching horror movies all by myself, much to my mother’s wonder. Watching horror movies by myself wasn’t a choice, just in case you’re wondering. Whenever I suggested that we watch a horror flick, no one in the family was really interested (even when I’ve prepared the usual popcorn and drinks) so I’m left sweating and shivering alone. Remember those times when the products of your imagination- something you can’t see, terrified you? Well, Ring did not fail to reawaken those old feelings of instinctual terror. From the first few pages of the book, one becomes aware of an unsettling presence. A strange feeling engulfs you and when you try to shake it off, you just can’t. There is a terrific connection between metaphysical horror and unreality. Since this is a race against time, one can’t help but sense an impending catastrophe waiting to happen. The videotape’s message of impending death would definitely terrify anyone. Some might dismiss this as a hoax, but of course, one can’t take any chances. Asakawa enlists his friend Ryuji’s help. Understandably, Asakawa grows increasingly wary, petulant and distraught as the seventh day nears. As Asakawa strives to counter the videotapes curse he is also faced with a dilemma, for when he chooses to show this to anyone, that person might end up dead after seven days too. When Ryuji agrees to help, Asakawa can’t help but admire Ryuji’s courage. Not only that, Ryuji proves to be the deus ex machina throughout the novel. 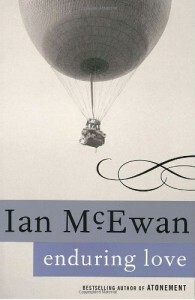 He steadily utilizes his connections and shows his brilliance throughout the novel. One can’t discount the fact that despite Ryuji’s peculiar character, he is loyal to his friend and dedicated, just as Asakawa is, to solve the mystery behind the videotape and avert an impending disaster. Every little success they encounter into unfolding the secrets of the videotape gives the reader a sense of relief but it is never complete and merely fleeting. One of the strongest points of this dark and compelling book is the almost tangible and perceptible sense of sinister evil permeating the story. What is so scary is that the object of fear isn’t a physical being but rather an invisible entity that terrifies because of its unreality and ‘absence’ in the story. The book touches on themes about metaphysical horrors that might be easily dismissed as preposterous. 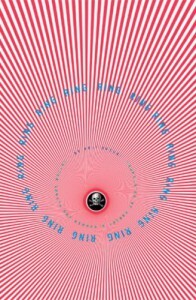 I would agree that the book is a concoction of somewhat fantastical and absurd elements but the writing is very convincing, so much so that the story becomes slightly plausible and even conceivable to even the most craven readers out there. If one expects bloodshed in this book then you are wrong. It is a very clever story, not the usual blood and gore you might expect from a horror book. The book expects you to maximize your imagination while it constantly spurns out the twists and turns that make this book so thrilling. The interest for the story never lags and it’s surprisingly stimulating. That’s saying a lot. I’ve read the usual horror books which weren’t very stimulating imagination wise, thanks to the lurid descriptions of horrifying events. This book expects you to use the most of your mental faculties. Not knowing what you are afraid of amplifies your imagination indeed. Another thing worth sharing is the book’s striking stance to impress upon us the vastness of facts relating to the paranormal and subjects concerning clairvoyance or ESP. The author offered these facts with clarity, perhaps not to be believed immediately, but to aid a reader in swallowing much of the difficult paranormal stuff the book presented. The author also didn’t fail to develop characters that we can sympathize with. The characters are distinct, never set aside and belittled despite the weighty subjects of the book. Their vulnerabilities and fears transfer to your own world making you aware of your own vulnerabilities. I have left out a great deal of the story deliberately, but only to ensure a future reader of the experience of suspense and thrills this book has to offer. I assure you, there are many of those surprising details that will keep you on the edge of your seat. A terrifying and suspenseful book about evil and horrors that are way beyond our comprehension. Expect a lot of twists and turns, and an ending that might surprise even the most avid fan of the horror genre. What struck me most is the capability of people to hide what they mean under the guise of somewhat innocent acts and language. While the straightforward nature of Yokō Ogawa’s prose drew me in inexplicably, considering the disturbing tones underlining each story, it still strikes me as beguiling that her simplicity of words can unsettle me. She easily exploits our familiarity and views about relationships, carefully leading us into the dark depths of suppressed emotions. She seems determined not to permit her characters to state bluntly what they are planning to do. Yokō Ogawa creates this innate tension that further confirms that there is always a possibility of cruelty and brutality hidden under manners and words. 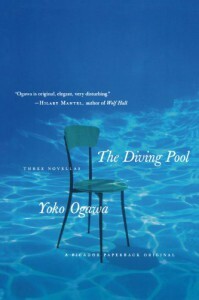 The Diving Pool is an undeniable medley of beauty and darkness, paired with the simple and unrelenting writing of Yokō Ogawa. 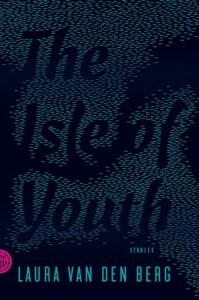 The conclusions of each story are entirely arbitrary, but the book’s entirety and its honesty will linger in the memory. Much of our decisions mold our lives into certain shapes. Some are forged with strength and without traces of doubt; while some can be ugly- figures so deformed they evoke the usual dread and regret brought about by badly-made decisions. But imagine a world that doesn’t dwell on individual choices, where everything is programmed to perfection, where everything is under control, where every need is provided for, and where anguish, fear, war and hunger are not known. Jonas is a resident of such a world. He lives in a community where roles are designated by elders based on an individual’s skills. This is a community who thrives without feelings, love and individuality. The world where Jonas lives in is robotic, fabricated and colorless. Everything is the same. Everything is so boring. Stuffed animals are objects of comfort. A front-buttoned jacket symbolizes the first signs of independence. Pills that suppress emotional desire, also called as “stirrings”, exemplify the need to subdue feelings. The demands imposed for precision of language and implicit acceptance of rules are not met with objections. It is as simple and as ‘perfect’ as that. There are no colors, no real memories and no love. The residents living in Jonas’ community have their lives created for them, without any meaning and purpose. Their existence is simply a mere fact and a lie. One thing that’s really interesting in the book is the community’s concept of love. According to Jonas’ mother, the word love has no meaning. This was explained to him when Jonas asked his parents if they loved him. Of course, in the world we live in, when someone asks you if you love them, that would either be a yes or no. In Jonas’ world however, love is insignificant. It made me feel uneasy because while the concept of love in modern society is usually confined to relationships we have, we also know of an adage that tells us that love makes the world go round. I don’t care how cliché that might sound, but it’s true isn’t it? So what’s keeping Jonas’ family and community together then? The practice of euthanasia (“Release”) in Jonas’ community is accepted. Usually ordered for the elderly, weak newborns, and for punishment in Jonas’ community, “Release” is just another vague and unquestioned rule. Of course, in our society today, concerns about the morality and legality of the practice of euthanasia are largely debated. Every year, a ceremony is held for each age group. At twelve years old, children are assigned a specific role. Jonas’ was chosen as the next Giver. It is an honorable role in the community, until Jonas himself experiences what this task demands from him. Only the Giver in the community is allowed to have real emotions, whether they are good or bad. He is the keeper of memories. As Jonas begins his training, he is perplexed by the multitude of emotions passed to him by The Giver. Horrific wars, unbearable pain and hunger, and sorrowful deaths threaten to consume Jonas’ mind. Yet the memories passed to him about belonging, uniqueness and love comfort him immensely. 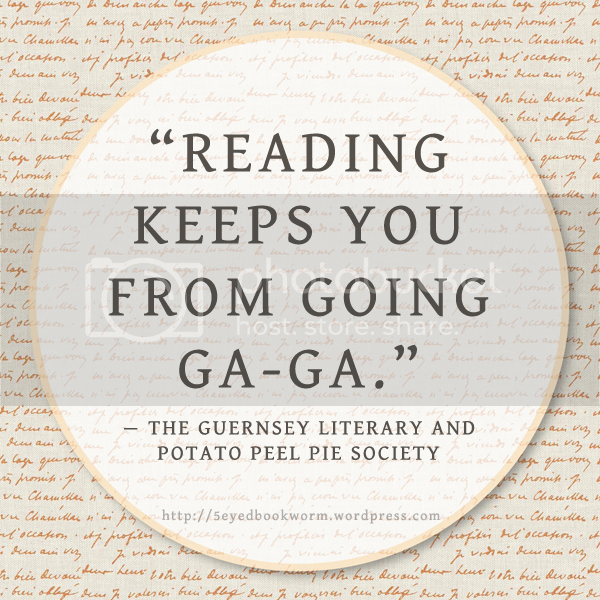 When The Giver gave him memories, Jonas was able to perceive new words and feel emotions. He also starts to question the basis of his community. Why have they accepted “Sameness” and relinquished all these memories? Why are the people in the community not allowed to feel or decide? Jonas begins to realize then that while the community presents a perfect façade, it is also plagued by the cloaks of denial and suppressed emotions. While most of his friends are free to discuss their training with anyone, Jonas wasn’t permitted to do so. Suddenly, there was a part of life he can no longer share with his family. This makes him lonely, frustrated and detached from his family and friends. Imagine not being able to share the grandeur and hues of a beautiful sunset, or the refreshingly vivid colors of flowers. Now that he knows the variety of emotions everyone in his community is ignorant about, he starts to understand its significance. The memories and feelings passed on to him are not merely facts for Jonas now but more of an acceptance of the real world. He now knows that whatever his community is allowed to ‘feel’ is shallow compared to what he is now capable of feeling. This renewed sense of living a real life compels Jonas to make a difficult decision towards the end of the book. While feelings of hope invade him- that somewhere there is a place where people can live with decisions, feelings and memories without prohibition, Jonas is now forced for the first time to make a decision. This decision, like any other, has untold consequences, gripping Jonas with fear and apprehension. A lot of people have questioned the book’s ending (or lack thereof). I didn’t find this a large issue. I definitely saw it as the reader’s freedom to interpret what happened to Jonas in the end. With that in mind, I want to think that Jonas had a happy ending. Surely the wisdom passed on to him will be of use to many, including him. I would like to think that Jonas defeated the world he lived in by making that decision in the end. This book is among the most frequently challenged books of our time. While I do understand parent’s concerns about the issues presented in this book (as with other banned books), simply ignoring these issues are just as bad. I believe that information and guidance is key whenever difficult issues are presented to children, be it from books or movies or television shows. Information, so as to allow the presentation of facts and concerns. Guidance, so as to allow a parent to discuss it with their child and guide them through the discovery of those facts. It’s ironic that a book that tries to defeat a world where freedom of choice is absent, can be banned because of the opinions of others. 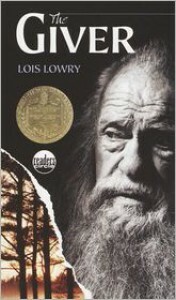 The Giver is a compelling read. I enjoyed reading it very much. The new life of Jonas, now filled with memories of the past and the enormity of the feelings humans are capable of, is moving and refreshing. The comforting memories of simple events such as birthdays and even grandparents evoke a sense of nostalgia and deeper appreciation of these experiences. The book forces you to dig deep within your thoughts and most importantly, it teaches us the value of freedom and individuality. Who knew a certain Ulysses Super-Suction Multi-Terrain 2000X vacuum cleaner can impart super powers and poetry writing prowess to a squirrel? Exactly! Who knew? But what a fantastic start to a veritable action-packed story featuring endearing characters, humor, not-so-common adventures, and witty dialogue. Flora, our heroine is a cynic, hates romance and is a comic book junkie. The story starts with Flora witnessing a squirrel getting sucked into a rather huge vacuum cleaner given as a gift to Tootie Tickham, Flora's neighbor. The squirrel lives, thanks to Flora's lifesaving action which she learned from a bonus comic book (called Terrible Things Can Happen To You!) at the back of every issue of The Illuminated Adventures of the Amazing Incandesto. The squirrel did not waste time showing its super powers, surprising Flora and Tootie (even yours truly). Convinced that the squirrel possessed super powers, Flora brings him home and aptly calls him Ulysses. And you know what inevitably comes next when we're talking about superheroes - adventure, an arch-nemesis and poetry. Somehow the incident with the vacuum has also given Ulysses the capacity to write poetry (makes me want to get sucked into a vacuum myself), has made him think of other things besides food, and also gave him the capacity to be profound and reflective of his world- "When did things become so beautiful? And if it has been this way all along, how is it that I never noticed before?" An unexpected arch-nemesis threatens to separate Flora and Ulysses and that's where their adventures begin. 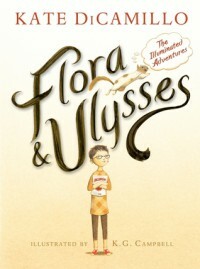 While the story itself was inventive and outstanding, the appeal of Flora and Ulysses lies in the characters. They are perky, unconventional, bright, witty and brave. One of my favorite characters from the book (aside from Flora and Ulysses, of course) is William Spiver. This little guy knew his way with words and he is not afraid to admit it- "I must admit that I have always had a certain facility with words. And I am terribly fond of the novel form. Though my interests lie less in the area of romance and more in the speculative nature of things. Science fiction, if you will. Fact blended in fantasy, an extended meditation on the nature of the universe." Ha! Adorable. The brilliant black-and-white illustrations by K.G. Campbell and Kate DiCamillo's writing provides us with a medley of beautiful art and words. The illustrations perfectly enhance the narrative. While the illustrations are in black and white, K.G. Campbell truly has the ability to show emotion (even gesticulations) through her drawings. 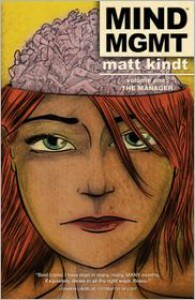 The use of comic book panels in the illustrations, of course, is a much talked-about feature of the book. The use of these elements in a children's book is believed to be ground-breaking. But the books appeal doesn't stop there. The essence and heart of the story is love, depicted in different ways and levels. I was surprised by how much the characters' experiences and relationships portray a deep message of forgiveness and love. This book makes you want to believe and hope. 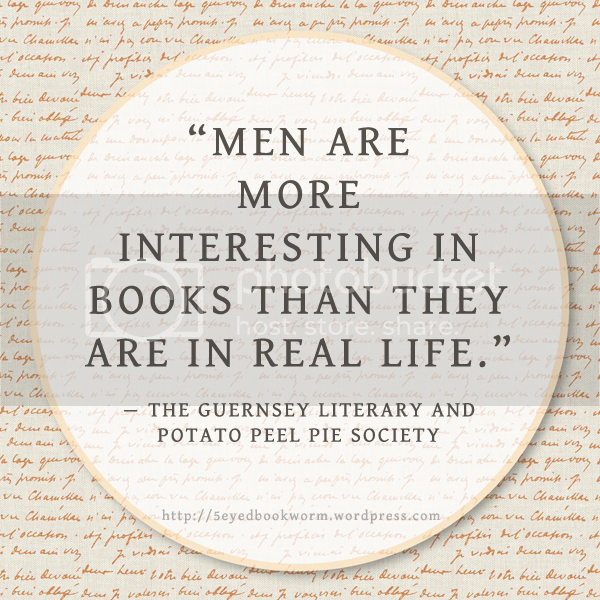 Yes, even if our heroine is a self-confessed cynic. Before reading this book I told myself that I'm going to shed any skepticism, obliterate any cynical cell within and just enjoy the story. When I was younger, I remember one of my teachers telling us about the difference between being childish and being child-like. The latter was much more desired. Needless to say, the book did not fail to awaken that child-like wonder in me. Reading this story reminded me of my younger days, traversing magical worlds and meeting implausible characters through books. I loved that familiar sting of excitement and wonder that we so often 'misplace' as we grow older. It's a wonderful thing when a book gives you the opportunity to relish the wonders of the impossible and for making you believe. Flora and Ulysses is an immensely enjoyable read. It's an engaging, original and heartwarming tale of love, friendship and family. The writing is beautiful. The characters themselves lend an emotional depth to the story. If you're going to read a children's book this year, make it this one. 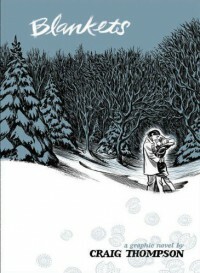 Blankets is a compulsively readable graphic novel that recounts certain stages of Craig Thompson’s life. Woven into all the illustrations and stories is a very compelling look at the formative experiences of the author. It is an exploration of childhood and growing up, being in love for the first time, and relationships within the family. It also explores the various struggles (emotional and spiritual) and obstacles Craig has to deal with. At its core is the powerful message of family, love, hope and liberation. What makes this graphic novel endearing and close to my heart is the humanity of its characters and the ability of the book to remind you of your own childhood. 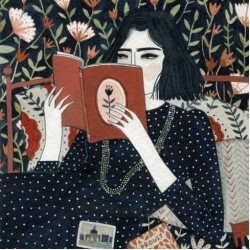 I found it fascinating how a book can allow you to enter a mind or an intimate universe merely because of its existence. There’s something tempting about learning how another person’s experience reflect your own. Blankets shows how life can have baffling contradictions and how our past molds us into our future self. The echoes of the past certainly won’t cease. Rather, they become reminders, lessons and poignant memories. Craig’s story embodies almost every experience we had when we were younger- our squabbles with our siblings, our complex relationships with our parents and friends, and even our struggles to find our own path in life. His insights about faith and relationships, while intimately his, are just some of the things I suddenly wanted to think about. It was absolutely fascinating to find Craig’s experiences identifiable. The stories within the book make you realize how vulnerable you are even if you constantly affirm that you can take care of yourself. His depictions of life within the confines of his home and Raina’s family evoked certain emotions in me – sadness, compassion, empathy and perhaps even pity for Craig, but it was also heartwarming and hopeful. Craig Thompson has successfully demonstrated that his personal accounts and memories could be rendered in graphic novel form, relating a tale of growing up while using amazingly detailed black-and-white illustrations. One would sense his use of visual metaphor all throughout the book. He uses black-and-white illustrations to complement his words. He uses symbols to help us make sense of Craig’s experiences and thoughts, and how this has molded him into who he is. I also noticed the author’s use of snow as a metaphor not only of beginnings or renewal, but also of isolation and endings. The blankets mentioned or seen in the book become a symbol of comfort, affection and togetherness. The quilted blanket Raina gives Craig symbolizes the patterns and contrasts we experience in life. The use of symbols in the author’s amazing and detailed illustrations coupled with the veracity of the story gives power to the book’s message. Audacious, heartfelt and beautiful, Blankets has won me over. It’s a poignant reminder of our own childhood and how moving forward is essential in life. 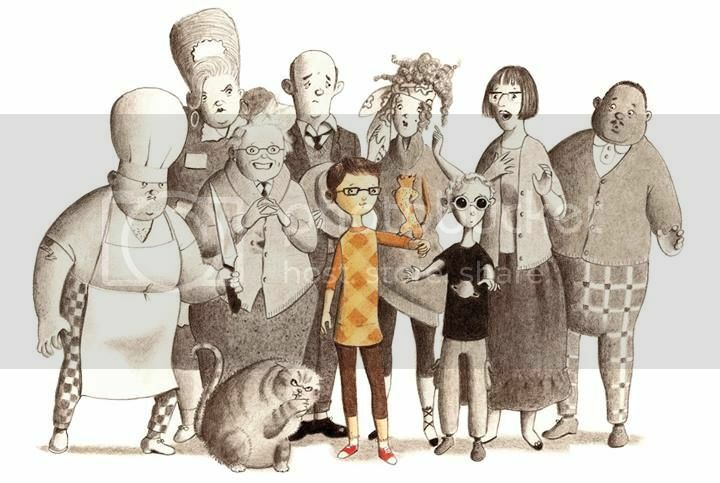 The humanness of the characters and stories become the attractions without discounting the brilliance of the illustrations. I would like to think that this graphic novel will erase all the doubts that certain people have about the potentials of this genre. I think it’s great that the author used this medium to portray his life. It was an absolutely great read. Highly recommended. >> READ THE REVIEW in my blog. >> READ NOTABLE QUOTES in my blog. An expedition to the Arctic headed by Dr. Kate Philo leads to the discovery of a human frozen in an iceberg- a discovery that undoubtedly surprised and enthralled not only the scientific community but the whole world. Utilizing a scientific procedure called ‘reanimation’ the team of scientists successfully revives the frozen man (Jeremiah Rice). This success did not go unnoticed. The project was initially met with praise, but not everyone was thrilled. It was later met with skepticism, controversy, anger and protests. Surely a discovery of this magnitude will have moral implications. Those involved were even accused of playing God. Inevitably, Jeremiah Rice became a reluctant celebrity overnight and his very existence triggers a series of events that will change the lives of all those involved in the project. 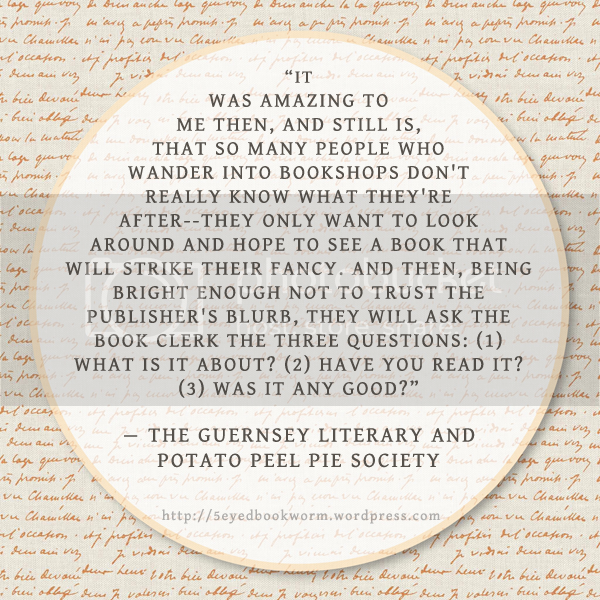 The Curiosity was an engrossing read right from the start. The story revolved around the science of cryogenics, the individuals involved, and the assimilation of Jeremiah Rice into modern society. The realm of science fiction often turn people off (including me, sometimes), for many reasons, but The Curiosity makes for one readable science fiction book simply because it was handled and written well. Mr. Kiernan did a great job in carefully pacing the story and melding a variety of themes together. The extraordinary has somewhat become convincing, while never touching the edges of absurdity. The story is told with shifting perspectives and allowed the characters to present themselves through their inner dialogues. There are some deeply moving lines in the story especially from Jeremiah Rice but my favorites were his hilarious commentary about body piercing, camera phones and supermarkets, just to name a few. Once I started it was hard to put down. 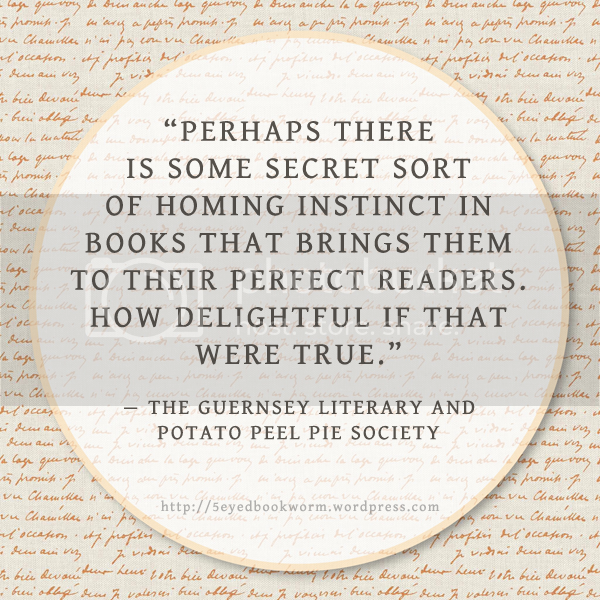 Perhaps the greatest strength of the book lies within its believable and interesting characters. While some are extraordinary in their own ways, some are downright despicable. It is a perfect mix of brilliant minds, compassionate individuals, and obnoxious and sleazy characters. It’s no surprise that I found Jeremiah Rice to be the most endearing character. He is a man radiating with wisdom and integrity. His opinions about our modern world resonated with me. Many underlying themes are incorporated in the book as well. While a large part of the narrative delved into science and the lives of those involved, it also explored relevant subjects such as ethics, religion, and the role of media in our society. In the novel, the author showed how influential and powerful the media is- it can twist facts and make people believe if it wants to. The book is never preachy though, and that’s the beauty of it. The author actually dares you to analyze these themes without imposing his own beliefs. My disappointment lies in the ending. I usually don’t have any problems with ‘hanging’ endings because it leaves room for limitless interpretations, but for this story, I wanted something concrete and believable (unless there’s a sequel). It’s a subjective (and minor) flaw, of course. Some people might not find this too much of a problem. 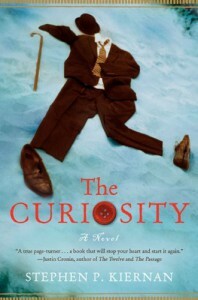 The Curiosity by Stephen P. Kiernan is not your typical science fiction novel. 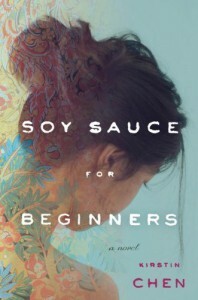 It is a well-rounded and brilliant debut novel denying blunt categorization. Blending science, romance, suspense and drama, this book has underlying themes that will appeal to almost everyone. I enjoyed reading this a lot. I would gladly recommend this to book clubs and to individuals organizing readalongs as it has a lot of issues fit for discussion. 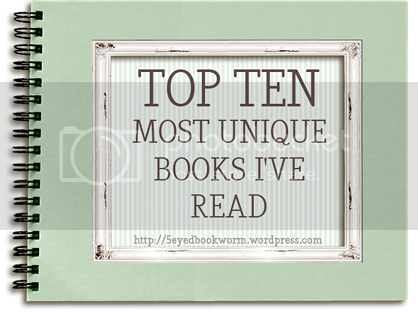 Readers who find great pleasure in reading books that are thought-provoking will be pleased.